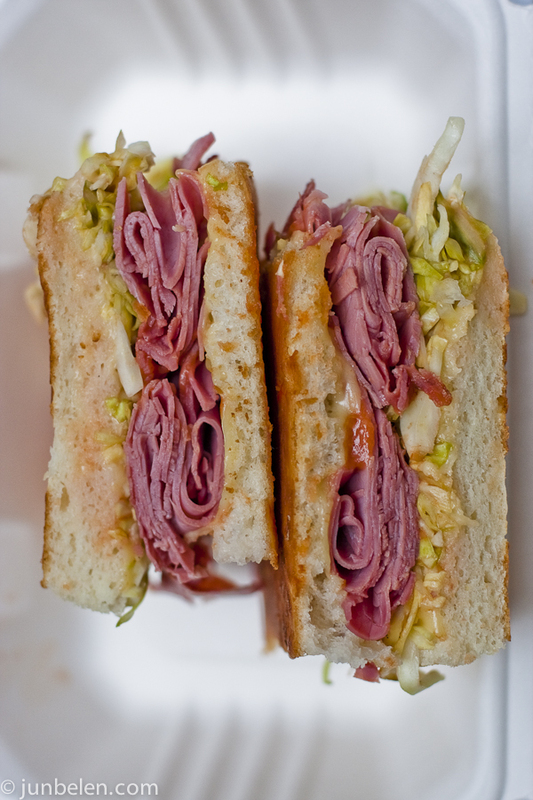 Sentinel serves corned beef at its finest with cabbage, Russian dressing and Swiss on tasty focacia. Their lunch menu consists of hot and cold sandwiches, salads and soups with specials that change everyday. Sentinel is lunch-to-go in the Financial District at New Montgomery Street and Stevenson Alley, a block away Market Street. On a lovely sunny day, there’s plenty of spots around to enjoy your corned beef sandwich alfresco and if it’s raining a great place to go take cover is at the Crocker Galleria a few blocks away. They have tables and chairs and heaters, too. And by the way, don’t forget to treat yourself to their chocolate chip cookie. It’s huge and it’s yummy. To learn how to make your own corned beef brisket and corned beef sandwich at home follow the links here to get the recipes. Delicious! I love how this one looks.